Coming off one of the most successful seasons in school history, Baylor coach Art Briles’ winning streak continued on the recruiting trail. Highlighted by some premier defensive recruits, Baylor signed its highest rated class of the Briles era Wednesday as it placed 30th in Scout.com’s national ratings. It’s the highest ranking since Baylor’s 2002 class finished 21st. 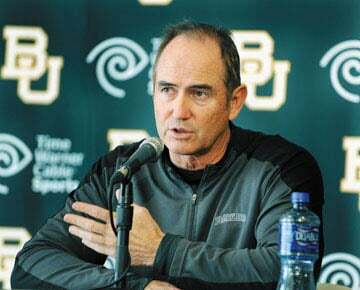 Most importantly, Briles believes his 23-player class addressed Baylor’s biggest needs. While the Bears signed talented offensive players like dynamic Richardson Pearce receiver Corey Coleman and promising Garland quarterback Seth Russell, their focus was to sign defensive players to impact a unit that finished near the bottom of the Big 12 in most categories. Briles believes Baylor hit the jackpot with four-star recruits like San Antonio Sam Houston defensive end Javonte Magee and Euless Trinity linebacker Brian Nance. The 6-5, 265-pound Magee is ranked the No. 7 defensive end in the 2012 class by Rivals.com after he collected 11 sacks in the fall. Rivals.com rated Baylor’s class No. 43 nationally. Nance is rated the No. 18 outside linebacker prospect in the country by ESPN.com. After a junior year when he collected 160 tackles, 13 sacks and six interceptions, Nance came back from an ACL tear last summer to finish with 67 tackles and five sacks in eight games as a senior. Baylor signed 14 players who could end up on defense, including four linemen, four linebackers and six defensive backs. Joining Magee on the defensive line are Denton Ryan’s Dominique Banks, Humble’s Zorell Ezell and McKinney Boyd’s Jamal Palmer. Baylor’s new class of linebackers includes Pearland’s Kendall Ehrlich, Riverside (Calif.) Community College’s Eddie Lackey and Sealy’s Shamycheal Chatman. Chatman was a late commitment after he cleared up some academic issues, and Briles is glad to have him on board. Baylor’s first verbal commitment in this year’s class was Stephenville’s Aiavion Edwards, who announced his intentions on Jan. 30, 2011. Edwards was a talented high school running back, but will play safety for the Bears. Baylor’s only local recruit is Midway defensive back Orion Stewart, who helped the Panthers reach the Class 4A Division I state championship game. Though Port Arthur Memorial’s Terrence Singleton was a Class 5A all-state quarterback, he could play defensive back or receiver for the Bears. At 5-10 and 175 pounds, he’s a tremendous athlete who has exhibited great leadership on the field. Baylor’s biggest offensive catch is Coleman, a first-team Class 4A all-state receiver who made 69 catches for 932 yards and 11 touchdowns and rushed for 567 yards and 15 scores as a Richardson Pearce senior. During his last three years of high school, he amassed 3,864 all-purpose yards. With Griffin headed to the NFL, Baylor signed Russell, a 6-3 dual-threat quarterback who passed for 1,502 yards and 12 touchdowns and rushed for 471 yards and seven scores as a Garland senior. Russell decided to sign with Baylor recently after originally committing to Kansas. Besides Coleman, Baylor also signed Carrollton Hebron receiver Kiante’ Griffin and Cypress-Fairbanks receiver Kaleb Moore. Moore is an intriguing prospect who has a history as a high jumper and long jumper but only recently began focusing on football. Another interesting prospect is Linden-Kildare’s Rashodrick Linwood, who was a dual-threat high school quarterback who will play running back and receiver for the Bears. Baylor also signed Burkburnett running back Devin Chafin, who rushed for 1,246 yards and 17 touchdowns as a senior. He also caught 40 passes for 400 yards and four scores as he was named Class 3A second-team all-state. Already stocked on the offensive line, Baylor signed only two players including Wylie’s Kyle Fuller and Port Arthur Memorial’s Tre’Von Armstead. Athens offensive lineman Cameron Bailey, who had committed to Baylor, is expected to play junior college football due to academic issues. All of the new players are from Texas except Lackey, a native of Murrieta, Calif., who signed in December and is enrolled at Baylor this semester. A quick look at all the new Baylor football recruits. Live updates from signing day — as soon as pen is put to paper.